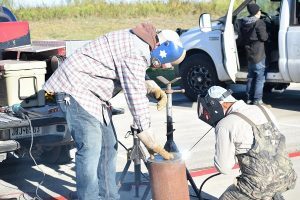 (HUTTO) – Ten teams competed in Texas State Technical College’s 2nd Annual Welding Pro-Am competition and Show-n-Shine Saturday, Oct. 28. Competing welders built miniature barbecue pits, which were sold after the competition to raise money for scholarships. All money raised at the event benefits the welding department at TSTC in Williamson County and will help provide scholarships for incoming students. Teams consisted of professional welders, and a welding student from the college was assigned to compete with each team. Welding Instructor Sam Flener said the event helps students build experience. “Being able to work with a professional and have that experience prior to going out into the profession and seeing how they work, the tools they use and the experience they bring adds another dimension to their experience,” she said. It also helps the students build industry contacts. Flener hopes to keep the event going next year and spread the word about TSTC. The team of student Jonathan Chesser and professional Troy Hendrix of BT Water Jets took first place. Student Nate Logiudice and Ky Benford of KBG Welding took second, and student Brantley Hearn along with the Samsung team placed third. TSTC in Williamson County Provost Edgar Padilla said that overall the event was a success. At the event, TSTC raised $13,000 from sponsorships, entry fees and raffle and food donations. The TSTC Foundation will match cash amounts raised. For more information on Texas State Technical College, visit tstc.edu. This entry was posted in Williamson County on November 9, 2017 by Debra Gonzalez.